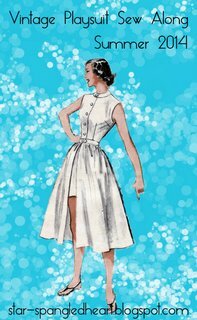 Announcing: The Vintage Playsuit Sew Along! | The Girl with the Star-Spangled Heart: Announcing: The Vintage Playsuit Sew Along! Announcing: The Vintage Playsuit Sew Along! A few months ago, I mentioned the possibility of hosting a sew along here on the blog. And the day has finally arrived to announce the opening of The Vintage Playsuit Sew Along! This is going to be a choose your own adventure type sew along. We'll each pick a vintage playsuit pattern and sew them up together. At the end of the sew along, we'll all have cute playsuits to wear this summer! May is going to be the inspiration month where we'll talk patterns, materials and planning your playsuit. June will be the sewing month although you are free to start sewing as soon as you have all of your materials! As a mini sew along within the sew along, I'll show you how to draft and sew up your own gathered dirndl skirt with a button placket. This will be kicking off in June. For this sew along, we'll define vintage as 1920s-1960s but mostly I'll be focusing on 1930s-1950s because that's what I like. While at least one piece of your playsuit must be you-made within the sew along time frame, feel free build your playsuit around a you-made or ready to wear piece already in your wardrobe. This is a great opportunity to rescue a wardrobe orphan or skip making a more challenge piece like shorts in favor of purchasing. So, grab a button for your blog and start planning your playsuit! Join up with other participants on the Flickr page and comment on any pin in the Pinterest board to be added as a pinner. I'm going to be in Paris the first half of june month, but if life isn't too crazy when I get back I'd love to join the sewalong! Aagh that is so pretty! Need to factor in work but if I can manage it then I'll be all aboard! Yay sew-along! Just the thing to get me in gear and make a great playsuit something I have wanted for quite some time now. So excited! Love this!! I am just about to finish a playsuit that I've been obsessing over for months, but who says I can't make another?!? I may have to jump in on this sew-along--thank you for hosting! Yay! Can't wait for the inspiration to start! I just finished a playsuit for the Sew for Victory 2.0 but of course I need another one! A playsuit is the capsule wardrobe for having fun. And I have a nice thrifted piece of fabric in mind to use! I need to do this! Oh yay!! I've got a playsuit pattern and fabric in my queue that I was planning on making this summer anyway. I'll have to bump it up in my sewing schedule! Ooh! I have had some fabric in my stash for years specifically put aside for a playsuit. Maybe now is the time to put it together! Oh lovely! What a great idea. I would like to join in too, I'm planning for winter coming, but I'm sure I can whip up a lovely summery play suit! Yes! You can also use modern patterns with a vintage feel. I've got some pattern inspiration coming up. Ah, what a great idea! I wanted to sew a playsuit for such a long time, but last year was so crazy and busy, so this year it's due. I have a lot of patterns, mainly 19040s and 1950s, I'm sure I'll find a nice one.